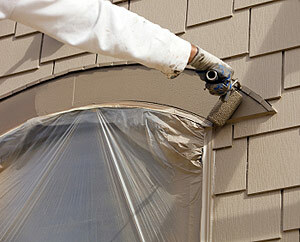 The appearance of your home’s exterior has a tremendous effect on its value. In addition the color and quality of the paint that you choose can also effectively reflect your individual taste and personality. Painting your home’s exterior is no light undertaking and it requires a fair amount of preparation and several steps in order to be done right. When done correctly your home’s surface will look its best for many years. Letting a professional handle the work can be one of the wisest decisions you can make as a homeowner. When you invite visitors to your home the exterior is the first thing that they see. Let that first impression be a great one with a quality exterior paint job from Color Me New! For a FREE, no obligation in-home idea consultation, or to request a free estimate, please click here to contact us. Over time the exterior of your home becomes covered with dirt and other environmental contaminants such as air pollution and mildew which can cause it to become unsightly. Power washing is the most effective way to remove dirt and other contaminants from your home’s exterior and make it look like new. In addition power washing is also the best method of preparing your home’s exterior for a fresh coat of paint since the presence of dirt and other undesirable particles such as mildew can interfere with the paint’s adhesion to your home’s surface. Mildew can wreak havoc on your home’s exterior and other wood surfaces such as fences and decks in a multitude of ways. If mildew is present on a surface that is to be painted it can have a detrimental effect on the adhesion of the paint. In addition if merely painted over it will soon reappear. Mildew can also cause unsightly discoloration on unfinished wood if left unchecked. For these reasons a quality exterior painting job or wood staining job will always include mildew removal as a crucial first step when mildew is found to be present. There are a great many benefits to properly staining and sealing unfinished wood surfaces. These include protecting the natural color of the wood, extending its life, preventing the wood from cracking or splitting, and making it resistant to mold, mildew, and fungus. In addition it will make the wood waterproof and rain resistant as well as protect it from the long-term effects of sunlight. Unfinished wood has a natural beauty that enhances your home’s appearance and adds to its value. Properly caring for that wood with high-quality staining will help it maintain that beauty for many years. A proper deck staining is the best way to have a wood deck that’s protected from stains, spills, mildew, water damage, and the sun’s damaging UV rays. A general rule of thumb is that most decks require a new stain every 2 years. A good way to see if it’s time for a new stain is to pour some water on the wood and see if it beads up or is absorbed by the wood. If it beads up the wood is still protected. Your home’s deck adds to its value and it should be properly cared for to keep it in peak condition. And of course a well-maintained deck is a great way to impress friends and family when you entertain! Staining your wood fence will help it last for years while maintaining a superior appearance. A properly applied stain will help prevent fading of the wood as well as splintering. In addition it will help prevent mildewing of the wood which can lead to unattractive discoloration. Treat your wood fence right with a quality stain and it will look great and stay strong for many years to come. "I hired Lee to paint my entire home, two levels, ceiling to floor. I have a ton of furniture and expensive hardwood floors and was worried about paint drips. Before I could mention my concern, Lee had already covered every square inch of exposed floor and furniture with clean tarps. His words were, "I treat every client's home as if it were my own." Very professional! I was so impressed with his work that I hired him to paint the walls in my office building as well." "Lee did a great job painting my living room (vaulted ceilings) stairway, dining room & kitchen as well as the ceilings in those rooms. Left the house clean." "Very professional & polite & trustworthy. I got a couple of quotes and Lee’s was the lowest but I felt the job he did was superior. I would definitely recommend him."